It is the second band of stormy weather within a few days. Northern Ireland, north Wales and north-west England are being pounded by gales and heavy rain in the second band of storms to hit the UK in three days. Forecasters say gusts of up to 80mph have hit Northern Ireland as the Atlantic weather front moves eastwards. Motorists faced chaos as several major bridges were affected by the gales and some areas were placed on flood alert. The second day of the prestigious Cheltenham horse racing festival has been abandoned because of the weather. The course is in good condition but fierce winds made the huge marquees in the tented hospitality area unsafe. The 55,000 people expected to attend the day's racing will get a full refund and the course is considering increasing its capacity for the rest of the week. In Cheshire, the M6 Thelwall Viaduct closed after three lorries overturned but there were no casualties. The vehicles have been cleared but the eight-lane stretch of the motorway spanning the Mersey and the Manchester ship canal is still closed at Thelwall because of the danger from high winds. There are two-mile tailbacks in both directions. High-sided vehicles are being advised against using the A533 Runcorn-Widnes bridge. The Humber Bridge is shut to high-sided vehicles and has a 30mph speed limit for all other vehicles. A tree fell on to a coach in high winds on the A26 near Uckfield in East Sussex at 0735 GMT. Sussex Police said the vehicle was empty apart from the driver, and no one was injured. 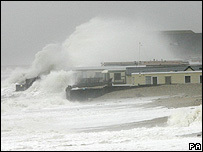 Ian Jackson, from Liverpool coastguard, said the storms were likely to continue in the North West for most of the day. He said: "The forecast is for the wind to decrease to force five, then perhaps come up again to force seven later on today." Steve Crosthwaite, of the Highways Agency, is tracking the progress of the storm. He said: "The winds will start to abate as the morning goes on but it will be very slow. "But as the winds go over the Pennines, round about late morning and early afternoon, the eastern side of the country will start getting hit as well." The Met Office has warnings of severe gales for all of the UK except northern Scotland and southern England. The Environment Agency has three flood warnings and 24 flood watches in place. BBC weather forecasters say a low pressure front could even bring snow to higher ground in parts of northern England and southern Scotland. Later on Wednesday, the storms will move across central northern England and East Anglia. Areas further south, which are still clearing up after Monday's storms, escaped the worst of the weather this time. The Energy Networks Association said of the 30,000 people who lost power in those storms just "a few hundred" in the east of England were still without supply.